No Age is a two-person experimental punk group consisting of guitarist Randy Randall and drummer/vocalist Dean Allen Spunt. The band is based in Los Angeles and is currently signed to Sub Pop records. No Age formed in December 2005 out of the ashes of their previous band, Wives, in which Dean played bass and sang and Randy played guitar. They played their first show at the New Image Art gallery for a show curated by friend and artist Rich Jacobs on January 22, 2006. Their first proper show was at The Smell in April 2006 with Mika Miko, BARR and more. "The Smell is where we got to experiment and find what kind of band we wanted to be. It pushed the boundaries of whatever ideas we had about music and artand we had a community to try out these new ideas," Randall told Drew Tewksbury in 2008. The band recorded 5 limited edition vinyl singles and EPs, and released them on 5 different labels on or around the same day, March 26, 2007. Designed by Brian Roettinger, Randall and Spunt, the back of each record's sleeve was a different color, and had one of the letters that, when you collected all of them, would join to spell "No Age." Half of the songs off these 5 EPs and singles were collected and released in album form under the title Weirdo Rippers, on June 11, 2007 through Fat Cat Records. The cover featured the exterior back wall of The Smell painted No Age and, below, Weirdo Rippers by Amanda Vietta, an artist and friend of No Age. The painting of the smell can also be seen in the band's first music video for the song Boy Void. No Age are known for their constant touring, community allegiance and playing un-traditional venues, such as their show at the Los Angeles River. A New Yorker article on the band from November 19, 2007 entitled Let It Rip earned them much acclaim and fans. 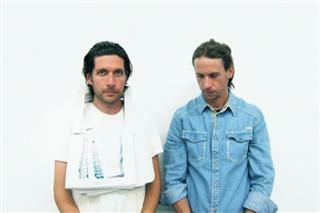 Buoyed by positive reviews in the music press, No Age signed to the prominent Seattle-based independent label Sub Pop. On January 25, 2008, No Age began their profile building month-long, 23-date tour with New York band Liars. Liars and No Age also released a joint 7" single limited to 1200 copies to coincide with the tour. 200 copies of the two-song single were sold on tour, with unique cover art for each individual city designed by Brian Roettinger, and the other 1000 featured hand letterpress-printed covers with different ink and vinyl color for each one. Fulfilling their tendency to play at un-traditional venues, No Age played a show at an Ethiopian restaurant named Queen of Sheba in Philadelphia. The change of venue took place at the last minute when Liars' Angus Andrew got sick beforehand. In April Randy Randall accompanied the Altamont Apparel skate team to Paris, France to film them for a short tour film entitled "The Foreigners," with the soundtrack featuring exclusively No Age music. The film is being distributed for free, at skateshops and accompanying certain Altamont products, and also features the video for Eraser. 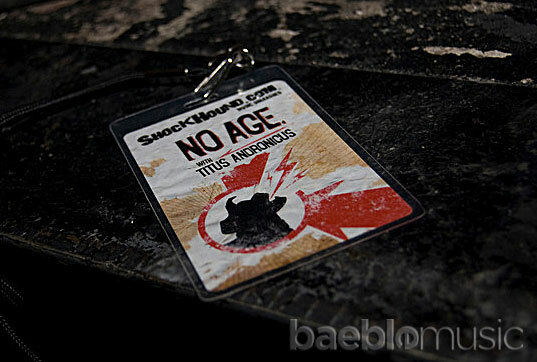 No Age appeared on a straight-to-VHS edition of Juan's Basement on April 22, 2008. The episode was broadcasted on Pitchfork Media's Pitchfork TV site. On May 6, 2008, No Age released their debut record for Sub Pop, Nouns. No Age appeared in an episode of VBS.tv "Practice Space," showing their Bushwick, New York practice space, which used to be a metal shop. In May 2008, UK music magazine Mojo named No Age one of the top ten best new acts, beside Bon Iver and Sub Pop labelmates Fleet Foxes. The band, along with Brian Roettinger were nominated for a Grammy for their design and packaging of the Nouns CD, which came with a 64 page book of art and photos. No Age worked with skateboarder Andrew Reynold's clothing company, Altamont Apparel, and for the company's fall line they contributed a collection for which the theme was "The human body's amazing capacity to heal." Those contributing were Hisham Baroocha, Sam McPheeters, Matthew Thurber, and the members of the group themselves. The group released the EP Losing Feeling on October 6, 2009. The release had a companion zine called "Losing Feeling" made by the band and Brian Roettinger that was for sale with pre-orders and also at art book stores Ooga Booga in Los Angeles and Printed Matter in New York. The zine was in an edition of 200. 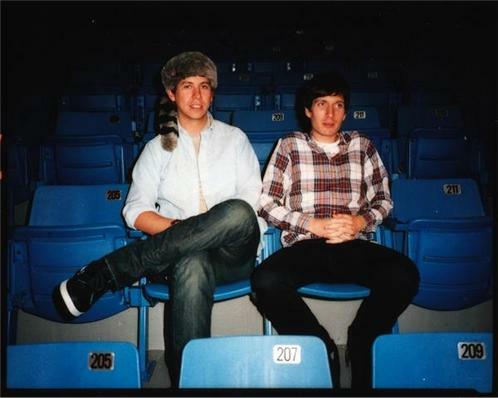 On June 24, 2010, No Age announced their new album, Everything In Between, along with the tracklisting. 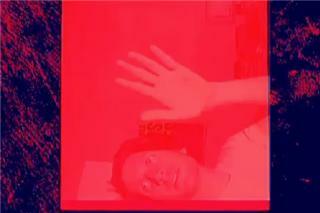 On July 28, No Age premiered the first single from the album, Glitter on a BBC 6 Music interview with Steve Lamacq. On August 10, the album's cover was released, and plans to release two Glitter singles were announced, along with their respective covers. The singles were released on August 24. Everything In Between was released on September 28, 2010, to generally favorable reviews.